The Conservative Party says it will make it harder to call strikes in certain "core" public services if it wins the general election. Under the plans, a strike affecting health, transport, fire services or schools would need the backing of 40% of eligible union members. Currently, a strike is valid if backed by a simple majority of those balloted. The Tories have already proposed a minimum 50% turnout in strike ballots, which unions say is "anti-democratic". They would also end a ban on using agency staff to cover for striking workers, impose a three-month time limit after a ballot for action to take place and curbs on picketing. The package of measures will feature in the party's manifesto for May's general election. Transport Secretary Patrick McLoughlin told BBC Radio 4's Today programme that a planned London bus strike on Tuesday 13 January had only been voted for by 16% of people entitled to take part in the ballot, and called the walk-out "ridiculous". "I think before a strike is allowed to go ahead it must have much more support from the union members and cannot be called by politicised union leaders," he said. But Frances O'Grady, general secretary of the TUC, said that participation in strike ballots and other types of vote should be improved by introducing online voting, in "safe and secure balloting". At the moment, strikes can only be called based on the results of a postal ballot - which "don't do the job", Ms O'Grady added. She said the government "continues to oppose this proposition", although Mr McLoughlin replied he would be willing to talk "in more detail" about such proposals. Unite general secretary Len McCluskey said the Conservative Party's proposed changes would have a "chilling" effect, and added the way to "resolve disputes was through negotiations - not to intimidate and silence by legislation". Ministers have repeatedly clashed with trade unions over pay - with a 1% cap on increases in the public sector - as well as changes to pensions and retirement ages. Last summer hundreds of thousands of public sector workers took part in a day of strike action across the UK, with Prime Minister David Cameron saying it was "time to legislate". Mr McLoughlin said trade unions were "important institutions with a strong history". But he added: "It is wrong that politicised union leaders can hold the country to ransom with demands that only a small percentage of their members voted for. That causes misery to millions of people; and it costs our economy too." He said the changes, which would be introduced in the first session of a Conservative-led Parliament, would "increase the legitimacy" of strike action held by unions. "It is only fair that the rights of unions are balanced with the rights of hard-working taxpayers who rely on key public services." The TUC has previously said imposing a minimum turnout would leave unions with "about as much power as Oliver Twist". Labour criticised those plans as "desperate stuff". 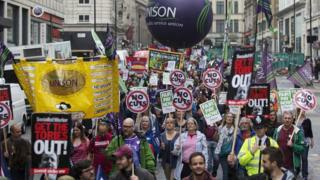 Unison general secretary Dave Prentis said the proposed measures would make it "virtually impossible for anyone in the public sector to go on strike". This, he added, would "shift the balance completely in favour of the government and employers, and away from dedicated public servants. "The UK already has tough laws on strikes - there is no need to make them stricter still." And GMB general secretary Paul Kenny said: "Only 16 out of 650 elected Members of Parliament secured the support of 40% of those entitled to vote in their parliamentary constituency area election in 2010. "Only 15 Tory MPs out of 303 secured that level of support. They had no hesitation in forming a government in 2010 without securing 40% support from the electorate." Public sector strikes: Why are workers walking out?